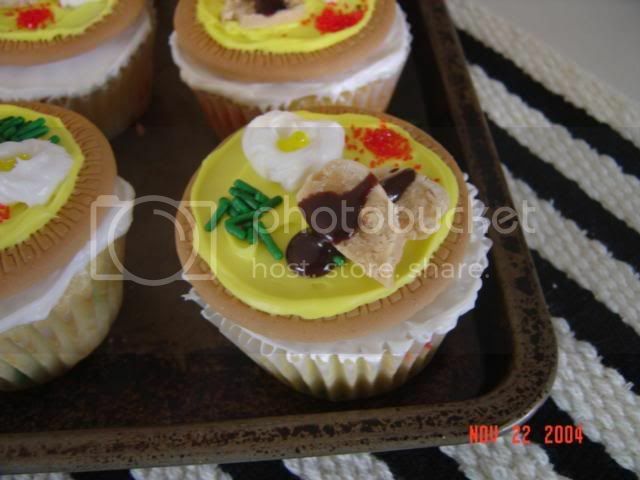 An American Housewife: Thanksgiving Cupcakes - Mini Thanksgiving Dinners! Thanksgiving Cupcakes - Mini Thanksgiving Dinners! It's that time of year again! Time to make my famous Mini Thanksgiving Dinner Cupcakes! These are a huge hit and everyone that see's them loves them. I've been making these every Thanksgiving since 2002 and they are a tradition in family now. We've brought these to large family get-togethers and the neices and newphews went crazy over them. We've also brought them to my kids school Thanksgiving parties and of course they are always a hit with kids and teachers alike. I hope to make mine tomorrow, will you be making yours as well? Slice the maple nut candies thin and layer them as 'turkey'. Dab some white frosting next to it for 'mashed potatoes' followed with a little dab of yellow gel food color as 'butter'. Melt your butterscotch or chocolate chips and thin with a little vegetable oil. Drizzle over the 'turkey' as gravy. Finish it off with the 'cranberries' (red colored sugar or non-perils) and little green 'peas' or 'beans'.